Reviewed: Marvel Now! Thor ARTFX+ Statue by Kotobukiya | 'TAIN'T THE MEAT… IT'S THE HUMANITY! The fifth and penultimate model from Kotobukiya’s Avengers Now! statue collection features the Norse God of thunder, Thor. The Japanese manufacturer’s Marvel Now! 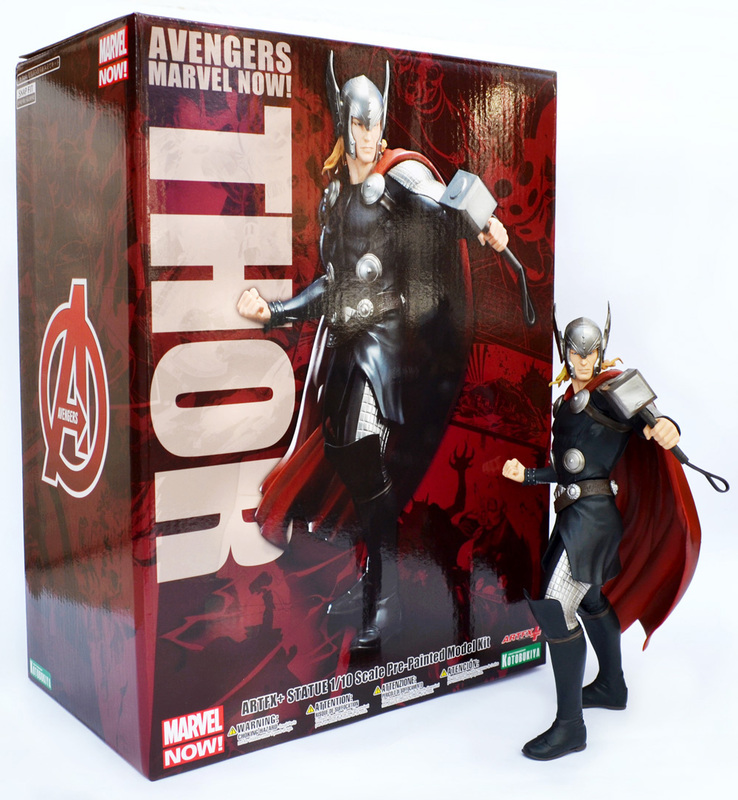 Thor ARTFX+ Statue was released in early November 2014, and is the latest snap together model kit based on artist Adi Granov’s concept artwork of The Avengers. The first statue, The Hulk, was released earlier this year and was followed by The Black Widow a couple of months later. The team’s ranks were swelled by Captain America in the summer, and then by Hawkeye in early October. Measuring eight and a half inches tall this model kit comes in seven different pieces. It occurred to me after I posted my last review from this collection that I’d neglected to describe the packaging for each model. I’m happy to rectify that now. Each statue ships in a sturdy cardboard box measuring approximately 6 x 9 x 13 inches, decorated with images of the statue and tinted panels from that character’s comic. Inside the box the statue is protected by two pieces of snap together blister packaging and each of the model’s pieces are wrapped in a clear plastic sheath – a nice touch. 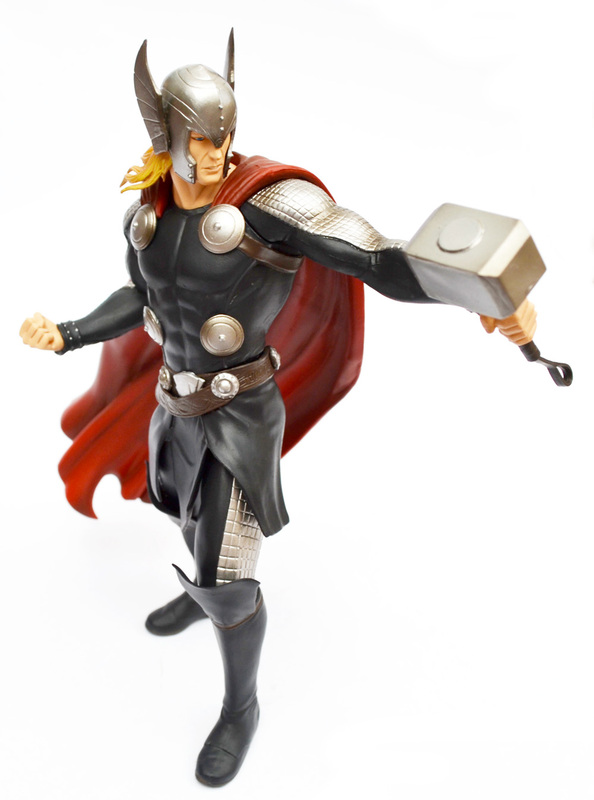 Thor is supplied pre-painted and no glueing is required to assemble the statue. Although the pieces fit together quite firmly some care must be taken when pushing Thor‘s arms into his sockets as his cape gets in the way a little. As with the other statues in this collection Kotobukiya have taken great care to ensure the seams between pieces are hidden by the various folds, belts and straps of the character’s costume. 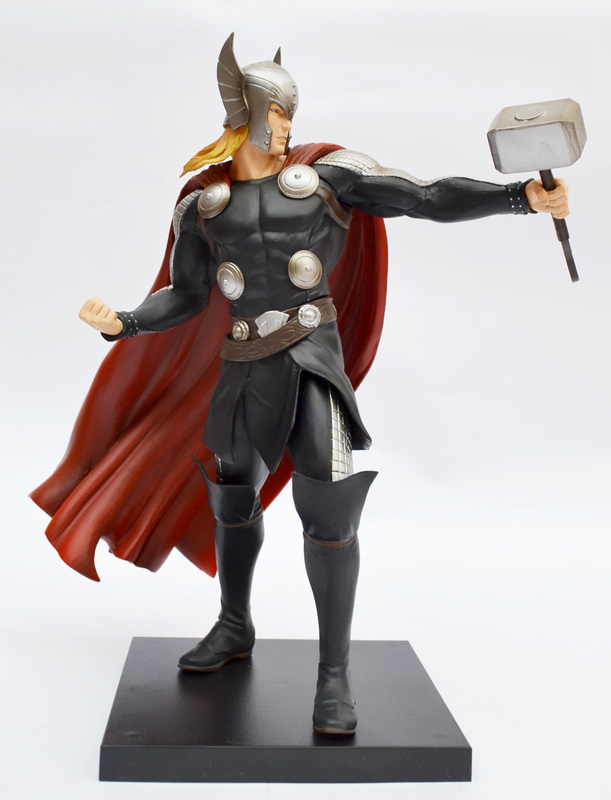 The statue also comes with one accessory –Mjolnir, Thor‘s mystic hammer. As with the other statues in this collection Thor also comes with an uninspiring square black base. I’ve previously noted my disappointment with the bases that accompany the statues in this collection – they’re just plain dull. The base is magnetic and is designed to hold Thor upright – thankfully, unlike the Captain America and Hawkeye statues which are both very wobbly on their feet, Thor stands perfectly well without his base. Now for the closer look at the statue itself. Thor stands in a suitably heroic stance, Mjolnir at the ready, and best foot forward with his red caping pillowing out behind him. Like the predecessors in this collection the level of workmanship is impressive, fit for a god! The moulding on his costume and cape is highly detailed, as is the attention given to both his hair and the chain-mail on his arms and legs. I particularly like the level of detail on his helmet as well as the celtic pattern on his belt. The paintwork is also very well done with some nice subtle shades of red in his cloak. Kotobukiya have even included the small silver rivets on his sleeves. 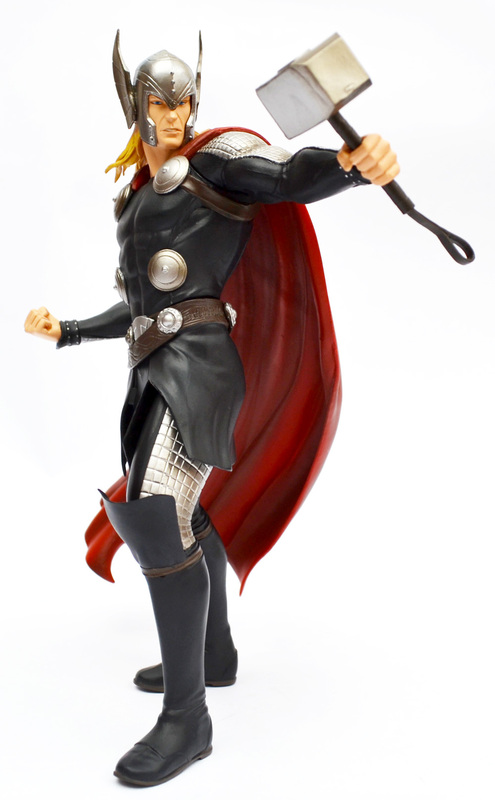 All-in-all Thor reinforces Kotobukiya’s reputation as purveyors of high quality statues. 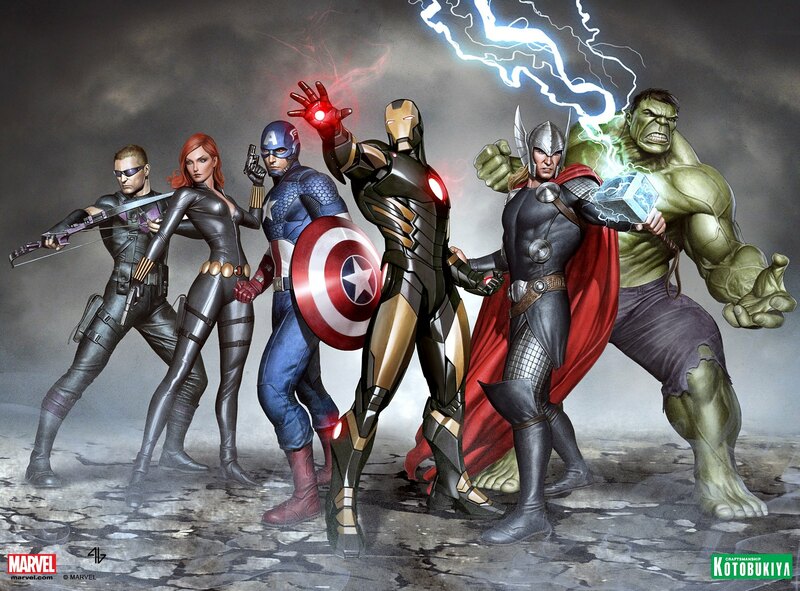 The Marvel Now! Thor ARTFX+ statue retails for around £/$45, which is pretty reasonable considering the level of work that’s gone into it. 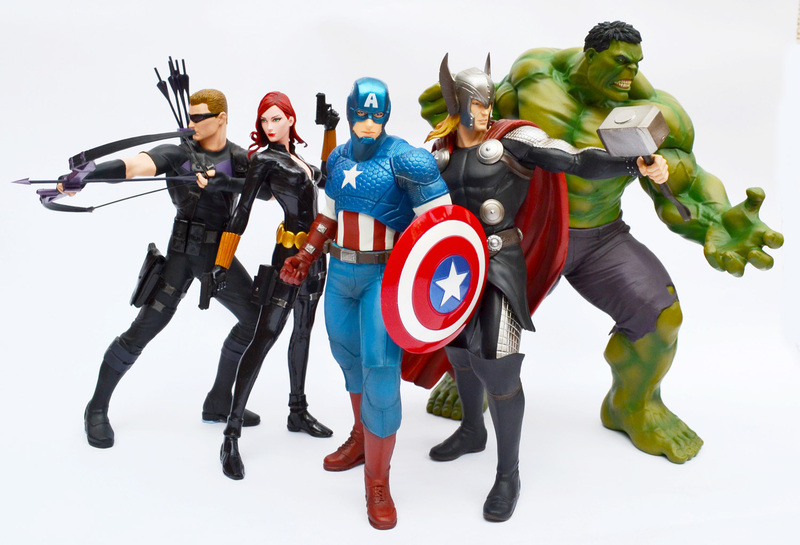 I’m particularly pleased that the model will stand unaided – after reviewing the Captain America and Hawkeye statues I’d feared that Thor‘s would also be unsure on his feet and I’m happy that such concerns were baseless (pun intended). 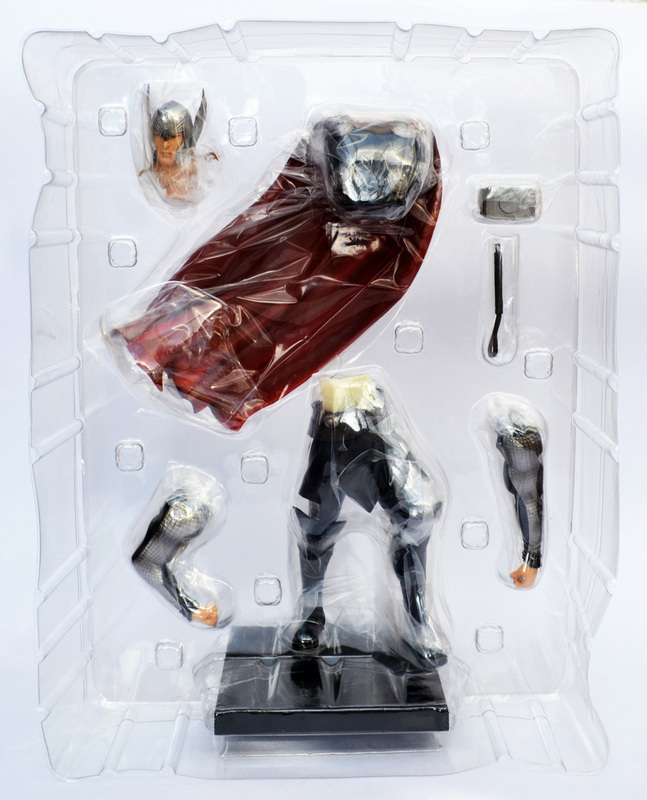 Kotobukiya are scheduled to release the last statue in this Avengers range, Iron Man, sometime in December. I’ll post my review and some images when I get my copy arrives (Update: click here).